Rabat- After the previous “World’s Oldest Man,” Francisco Nuñez Olivera passed away at the age of 113, 112-year-old Japanese man, Masazo Nonaka, has taken up the title in the Guinness World Records. Flashing the world’s oldest smile to the camera while taking bites of the cake offered to him on the occasion, Masazo Nonaka celebrated 112 years. 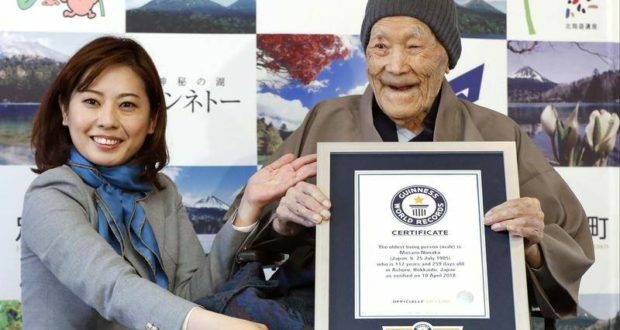 Nonaka won the title “World’s Oldest Man” per the official Guinness records certificate he received on Tuesday, April 10, in his hometown, Ashoro on the island of Hokkaido in Japan. Nonaka was born on July 25, 1905. Today, he is precisely 112 years and 260 days old. Guinness World Records notes that Nonaka was born just months before Einstein published his major theory of relativity. In 1931, Nonaka married Hatsuno with whom he has five children. The super-centenarian spent the early days of his retirement sumo-wrestling, reading newspapers, and eating all kinds of sweets. He now spends his time surrounded by his family and cozied up with his pet cats of whom he is very fond. His granddaughter told Agence France-Presse (AFP) that, although he uses a wheelchair to move around, his general condition is good. “Mr Nonaka’s achievement is remarkable… he can teach us all an important lesson about the value of life and how to stretch the limits of human longevity,” expressed Guinness World Records Chief Editor, Craig Glenday. The all-time “Oldest Person Ever” title still belongs to Jeanne Louise Calment from France who lived for 122 years and passed in 1997. As a note, Guinness Records is conducting research to find the world’s Oldest Living Woman.